I have always been a fan of ethnic foods. One of my early loves was Mexican. Where I grew up, in North Florida, there was a great mom-n-pop Mexican restaurant my parents would always take me to. It was there that I learned a serious appreciation for great salsa. Even though I didn't like spicy foods until I grew up, I always chowed down on the salsa that the server would bring to our tables. However, being the do-it-yourself kind of person I am, I had to learn how to make my very own salsa. My favorite recipe was a very simple one, but after I learned about fermentation and how amazing fermented foods could be, I tried to ferment my salsa recipe. It turned out even better than it was before! There are more bacterial cells in our bodies than there are our own cells. These bacteria are considered to be our microbiome. A healthy microbiome can improve immunity, metabolism, sustains the gastrointestinal tract, supports healthy mood and brain functions, aids in proper nutrient production and absorption, as well as helping maintain healthy weight. Eating fermented foods is one of the easiest ways to balance your microbiome. When your microbiome is unbalanced, a number of health issues can easily develop, including depression and digestive conditions. This is especially important after a prolonged illness and after taking antibiotics. So here it is, just in time for summer, freshly fermented salsa! Mix all the ingredients together, if you like your salsa smooth, feel free to use your food processor. Place the salsa in a fermentation container, pressing down to release some liquid. Ideally the vegetables should be submerged under the liquid. Add a bit of extra water if needed. Ferment for 2+ days at room temperature. Once the fermentation period is complete, the salsa can be removed to a storage container and stored in the refrigerator or root cellar. 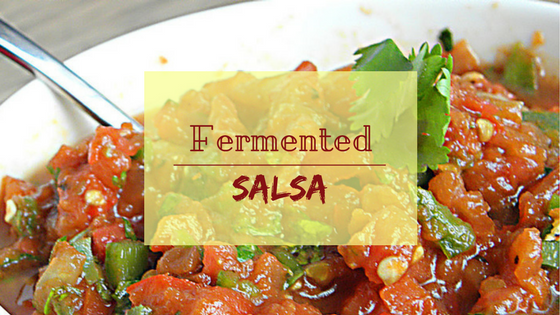 *If you don't want to wait, this makes a great fresh salsa without the fermentation. Now, I also have a major love affair for avocados. Because of this, every time I make salsa, I have to use some of it to make some delicious guacamole. I felt that I couldn't share my salsa without also sharing my guacamole. I hope you enjoy! Cut the avocados in half and carefully remove the pit. Scoop out the flesh of the avocados and place in a medium bowl. Add the salsa and spices and mash with a fork until just incorporated but still lumpy. I hope you enjoy this salsa and guacamole as much as my family does! If you have any questions or comments, please leave them below!